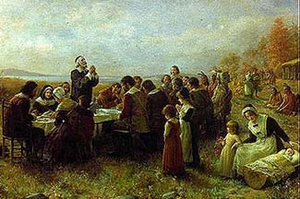 Thanksgiving is an uniquely American celebration that began nearly four centuries ago with a deeply religious people, the Pilgrims, giving thanks to God for preserving them though a very hard year and bringing them their first bountiful harvest which they gratefully shared with their indigenous neighbors. In recent years the ‘politically correct’/secular crowd has rewritten the history of the First Thanksgiving placing an emphasis upon the hand that the indigenous American Indians played in helping the original Pilgrim community to survive. In the process they have redirected the emphasis on thanks towards neighbors and friends and away from the providence of Almighty God. While it is always good to be thankful for others who have enriched our own lives and certainly that has a good part to play in the celebration. Nevertheless the major emphasis of Thanksgiving should always be upon giving thanks to God along with our family and friends as it was on that very first occasion. While it is always good to be thankful for others who have enriched our own lives and certainly that has a good part to play in the celebration. Nevertheless the major emphasis of Thanksgiving should always be upon God as it was on that very first occasion. Thanksgiving is a uniquely American celebration that began nearly four centuries ago with a deeply religious people, the Pilgrims, giving thanks to God for preserving them though a very hard year and bringing them their first bountiful harvest which they gratefully shared with their indigenous neighbors.